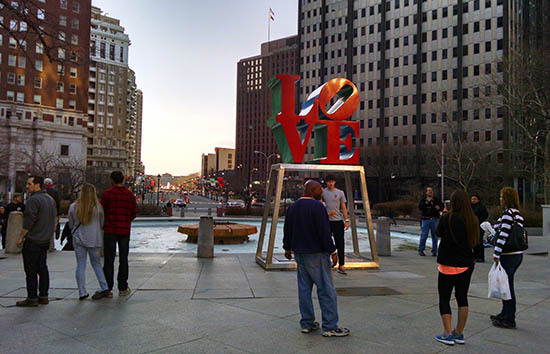 Having visited Boston and DC in 2014, Alex and I wanted to continue visiting East-coast cities, and our next stop was Philadelphia. During college, I’d spent a lot of time in Philadelphia as part of the crew team. And growing up, I had family nearby. But, neither brought me into the city center with any frequency. 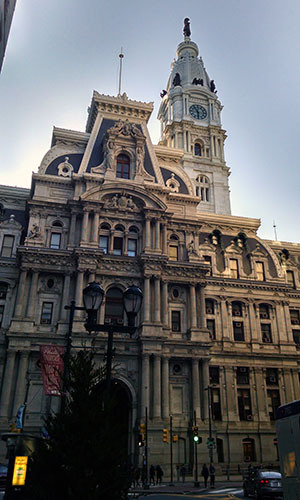 In fact, the last time I think I was actually in Philly proper was ’96… almost two decades ago. 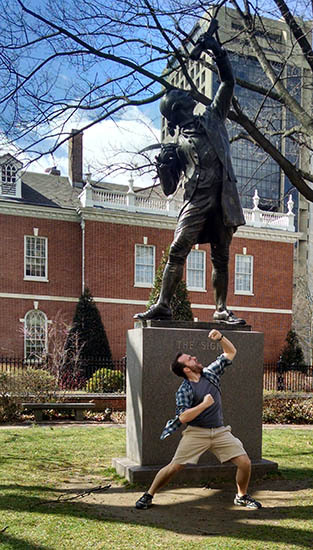 There’s a lot to see in Philly, starting with the American revolution sights. I say that, because that’s where we started – at an unexpected Megabus stop right in front of Independence Hall. 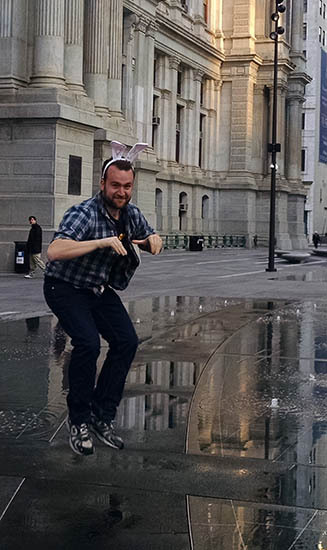 We started off in the Independence Hall area. 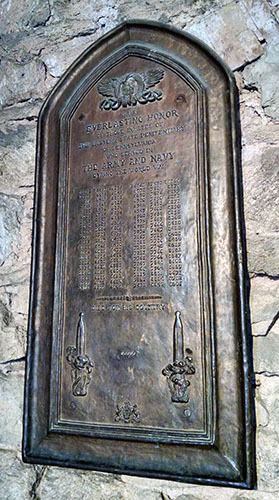 To tour the hall, you need to stop by the visitor center for a free ticket at an appointed time. Arriving at 10, our ticket was scheduled for 2:30. 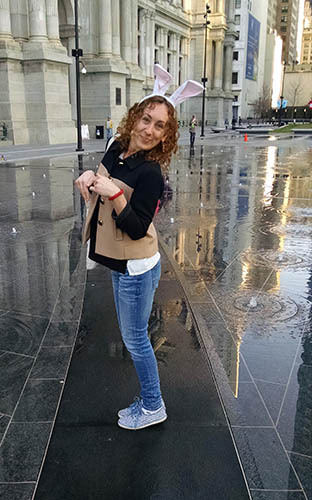 We wandered around the nearby historic sights: the Liberty Bell, Carpenter Hall, etc etc. 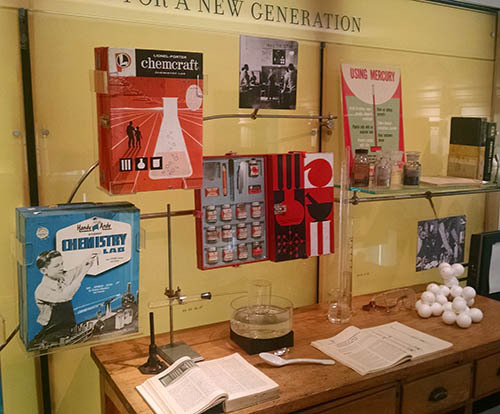 Right across the street was the Chemical Heritage Museum, a free museum dedicated to the history of chemistry. The highlight here was suprisingly a touchscreen display that showed illustrative videos of each element. We also stopped at the tiny Thaddeus Kosciuszko National Historic Site, the smallest national site in the country. Kosciuszko was a Polish freedom fighter who made a name for himself during the revolution. There’s two bridges dedicated to him in upstate NY, which nobody can pronounce. So we call them the twin bridges. 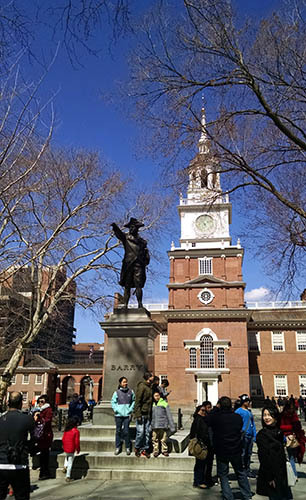 Independence Hall was a lot of fun, but the rangers giving the tours were peculiar and disengaged – repeating themselves. Nonetheless, we saw the first congress rooms (from when Philadelphia was the provisional national capitol), as well as the famous Independence Hall. They’re all smaller than you’d expect. A few blocks away there’s a great traditional soda fountain. 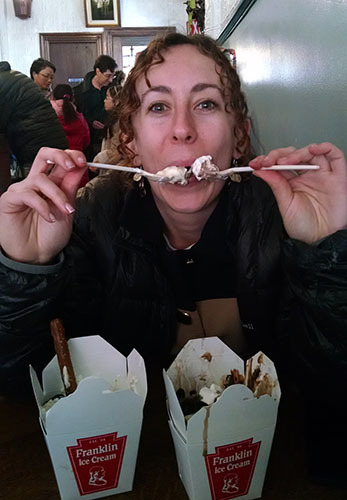 We got huge ice cream sundaes… they were enormous. 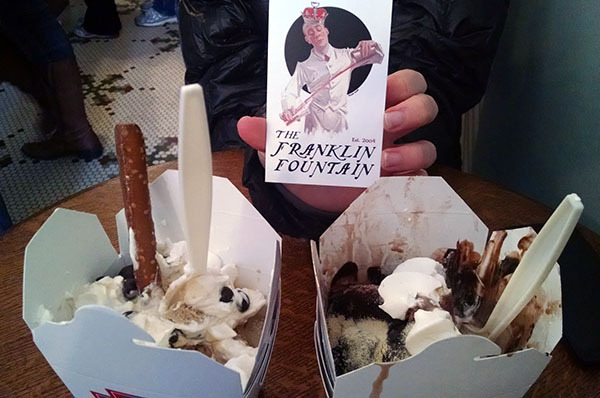 I got a ‘Mt Vesuvius’ (chocolate ice cream with brownie chunks, hot fudge, malt powder and whipped cream), while Alex got a ‘Lightning Rod’ (chocolate brownie pieces with coffee ice cream, covered in espresso, espresso beans, white chocolate, with a hard pretzel). 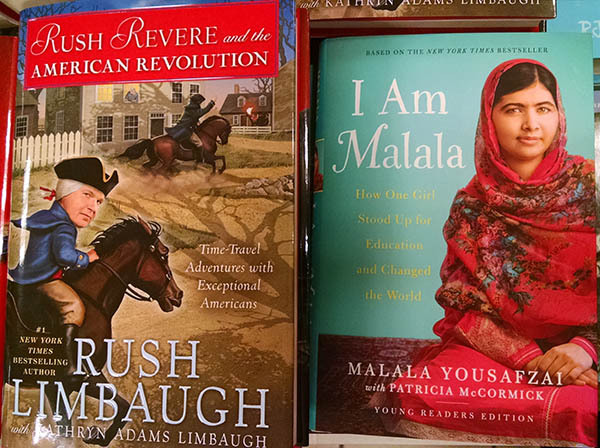 Yeah – ridiculous. Organ, at Wanamaker Department Store. Just like Florence. We took a quick stop at Elfreth’s Alley, a short street that’s considered the oldest continuously-inhabited residential street in the country. Then we walked to the north-center of the city, Chinatown, to check into our hotel – cheap, but centrally located. Plus we got to wander around the nearby grocery stores. Dropping off our bags, we left to check out the Wanamaker Organ, an enormous organ located in a majestic open space at the center of Wanamaker’s department store (now owned by Macy’s). An organist performs twice a week and we were lucky enough to arrive just in time. Hungry, we turned the corner to visit Reading Terminal Market – but unfortunately, it was just closing up. It’s a sort of cafeteria/farmers market, and we walked past numerous booths being closed for the day. All filled with tasty food we couldn’t eat. The rest of the night was spent at the hotel and a nearby bar, where we watched the March Madness semifinals (Wisconsin upsetting Kentucky) and drank local beer. 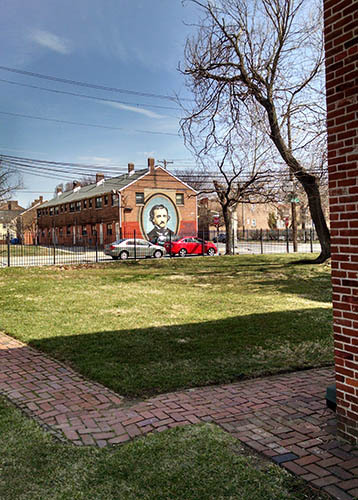 The next morning, we walked through Chinatown to our first stop at Poe House, another small national historic site. This may have been the most depressing historical site I’ve been to, but maybe also authentic (it was in a state of unabashed disrepair). It doesn’t take very long to visit – only really recommended for Poe enthusiasts. The major stop of the day was Eastern State Penitentiary. on the western side of the central city. 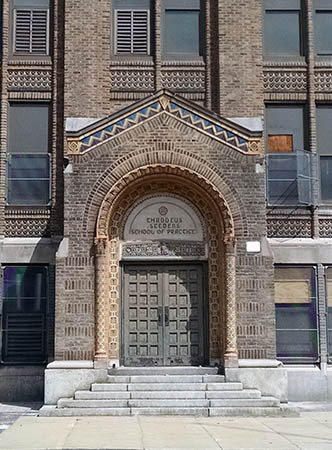 Along the way, we got a look at some great murals and brownstones, as well as the Thaddeus Stevens School, a striking Gothic building. 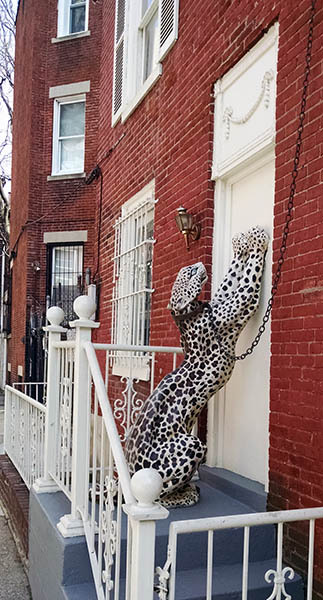 Philadelphia’s Mural Arts Program is an expansive program that gives the city a lot of color. The goal, when the program was instituted, was to discourage graffiti. 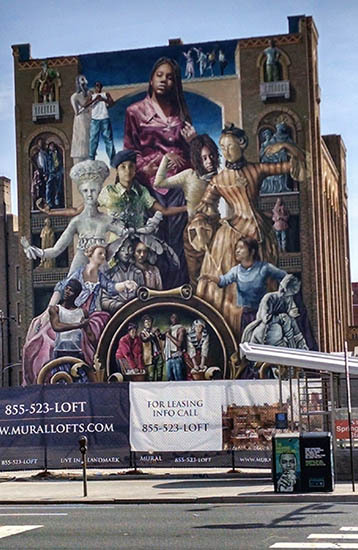 It looks like it worked, and the murals are both interesting and beautiful. 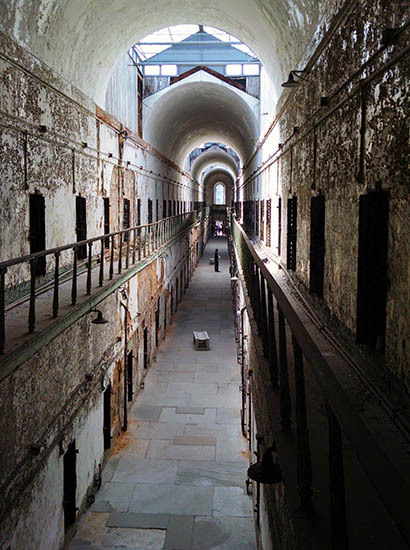 Eastern State was a prison that operated from 1829 through the 1970s, before falling into disrepair. Admission gets you an audio tour guided by none other than Steve Buscemi. It’s a remarkable site and the highlight of the trip for me. The prison went through a lot of phases: the initial goal was the keep prisoners in complete silence for their (relatively short) sentences. Guards and prisoners didn’t wear shoes, and prisoners were kept in solitary confinement. This was an improvement from earlier prisons that kept all the prisoners together, but was obviously inhumane by modern standards. 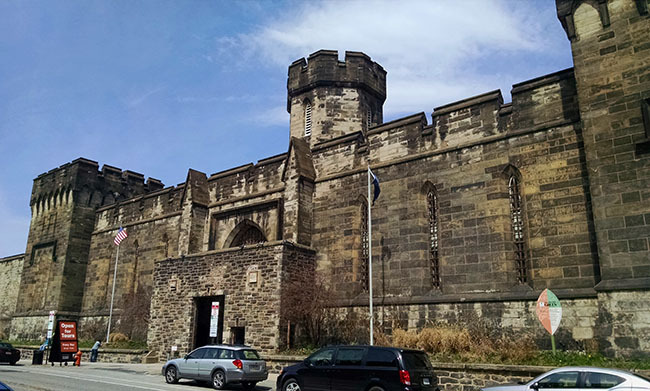 Eventually it became a more conventional prison before being shut down after operating for almost 150 years. 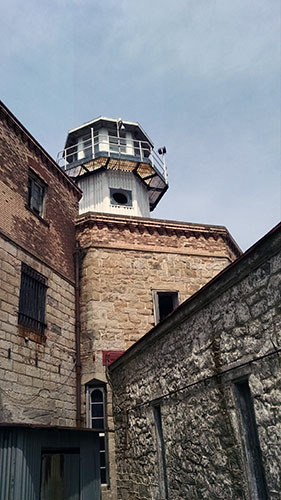 There were a lot of escape attempts from Eastern State, some successful – the remains of some are still visible. Also interesting was the initial design of the prison, which was something of a panopticon: the prison had a single central point, with cellblocks radiating out in a circular pattern. A single guard standing at the center point could look down every hallway in the prison. As the prison grew, this was abandoned: the spokes of the wheels were filled in, additional floors were built, and so on. Nowadays, the prison is open for tours. It hosts haunted houses at Halloween, and some cells have artwork. I really enjoyed the artwork actually – it gave some perspective. 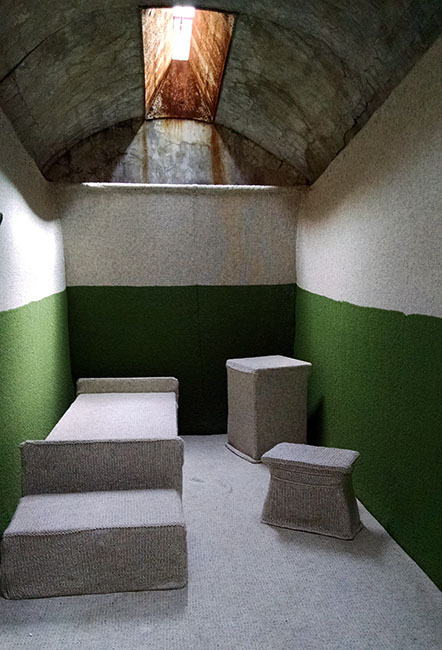 One piece replicated a Gitmo cell inside the jail cell: the Gitmo cells are chainlink and much smaller than these stone cells dating from 1829. Another looked to shift the perspective from prisoners to their victims by painting all the victims and hanging the paintings from the ceiling of a cell. Also interesting were a set of TVs showing clips from famous prison movies, situated in an appropriate setting: the shower scene from Shawshank in an actual prison shower, for instance. Maybe my favorite was an entire knit cell, which took months to complete. The knitting represents the expansive amount of time prisoners spent in cells. Very clever. 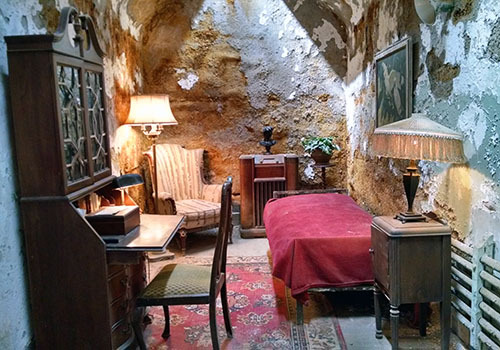 Oh yeah, Al Capone was housed in the prison for a while. He had a comfortable cell, outside the normal prisoner area – right near the guards; he also had his own radio. 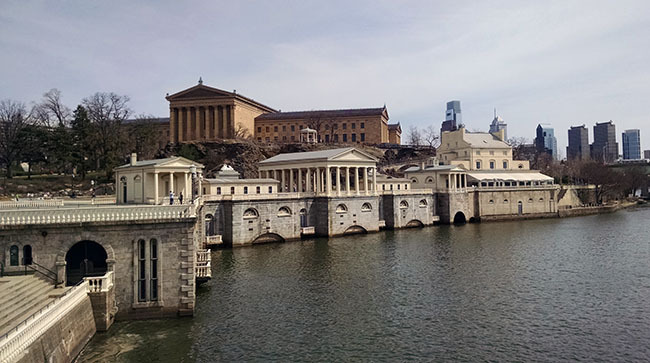 Leaving the penitentiary, we meandered to the Schuylkill river, past boathouse row, and down along the Rocky steps of the Philadelphia Museum of Art. Then we cut in to Rittenhouse Square for lunch. The last walk of the day was along the main street. Lots of modern art and civic buildings (such as Claes Oldenburg pieces), fountains, memorial sculptures, etc. It was Easter, so of course had to celebrate. 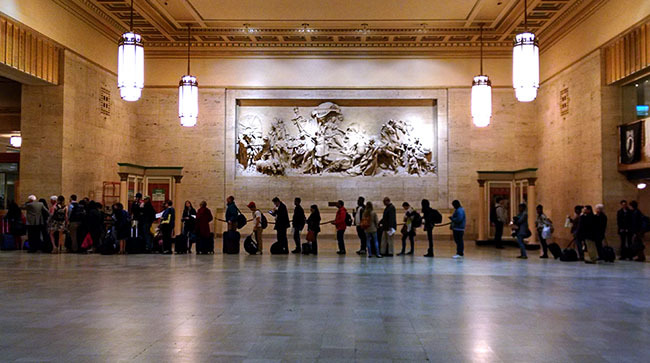 Eventually we ended up waiting in line behind the train station for the Megabus to bring us back to NY. 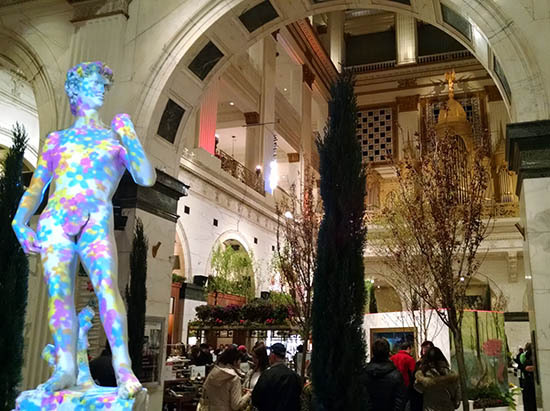 All in all, it was an enjoyable weekend that gave me a new perspective on Philadelphia. This entry was posted in Uncategorized on April 29, 2015 by rob.